Unlike most of us, dogs are not terribly concerned with caloric intake, grams of fat, cholesterol, or nutrition. They will happily eat just about anything we give them, and most will thrive on a diet of commercial dog food of one sort or another. Some dogs will eat until they can't move. Others will go off their food at the slightest change in their surroundings - How do you make sure that they are getting the proper nutrition that they need? Depending on the feeding method that you use, you can easily control the food intake and supplements that your dog eats. However, many dogs are overweight. Feeding portions on many dog foods are sometimes vague, and most of us can't resist that soulful gaze when the bowl is empty. Depending on their activity level, where they live (inside or outside), and the climate, dogs, like people, require more or less calories to maintain an optimum weight. Using these estimates, my 110lb and 100lb Akitas require ~2800 calories each for normal activity, which would be the equivalent of approximately 5 pounds of canned food, 2 lbs of moist food, or 1.8 lbs of dry food per dog . You can see why we don't feed canned food! Yikes! But what kind of food should you feed? I've also compiled comparison of popular dog food brands with basic nutritional information and ingredients to get some more detailed information. more than 50 lbs should not be exclusively "inside" dogs. If your dog spends a majority of it's time outside, they will need more calories as the temperature gets lower. Usually, this can be accomplished by adding extra fats and oils to the food to give them a good source of high-energy calories (from fat), and increasing the amount of food to maintain balanced nutrition. Again, as the temperature changes, your dog will need more or less food. This table is more useful for dogs that are not usually outside all the time, but will be spending time outside for a specific reason - ie, hunting, camping, whatever. 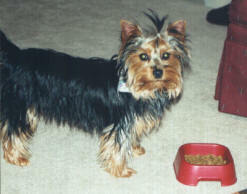 Many small breeds reach their adult size before a year of age, while larger breeds may take two years or more. By tracking the puppies weight to it's age, you can tell how many calories your puppies need for any given day. This is not, obviously, an exact science, but it is a pretty good starting point.